Ours is not the casual evil of the murderer in the alley or the butchery of men. We are those whom Heaven has mandated to bring suffering to the world. We are those who have been told to make all of creation howl with pain and fear. We are those entrusted with the flaying of the Universe. And we enjoy our work. . . very, very much. Dharma Book: Devil-Tigers is the first in the series of Dharma Books for Kindred of the East, following in the tradition of Vampire's Clanbooks. 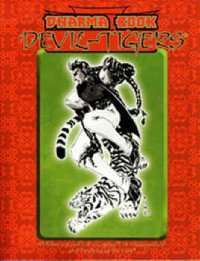 It details the powers, secrets and hidden agendas of the Devil-Tigers. Outsiders consider these undead monsters, wanton killers, infernalists or beasts. Those who follow this Dharma only laugh at such notions. The truth, you see, is far, far worse.